It's that time of year when the season for fishing tournaments is getting fired up. Bass Champs caters to four regions in Texas, and the first 2010 event occurred on Lake Amistad January 16 for the South Region. After the Arctic blast that blew through two weeks ago, this was by far the best day to be outdoors Del Rio has seen so far this year. Over 200 teams competed, with Terry Oldham and Jaime Buitron claiming the first win of the season. This was one of those times when their kicker was the real kicker. The day had started out chilly in the upper 40's, but warmed throughout the day to nearly 60 degrees. The lake was calm with just a slight chop. Perfect conditions for big bass and heavy sacks. Winners Terry Oldham and Jaime Butron came into the tournament somewhat cold - no pun intended. Although they did not get to do any pre-fishing, they are familiar with the lake. "I knew the bass would be deep," Oldham reported. "Fishing in deeper water, 30'-50' deep was going to be key." Owner of Oldham lures, Terry went to work building a 1 ½ oz football head jig to accommodate the fishing conditions they expected to face. "We were using a new color, green pumpkin with a pearlescent blue sheen with matching craw trailers." The team traveled about 10 miles to their targeted area to fish main lake ledges. "We had our three biggest fish by 9:00. It got tough after that." They had close to 32 pounds with three fish. Among them was an 11.74 lb kicker! "Our electronics played a big part in our success today." They wrapped up their limit, and won with 37.12 lbs and dominating with a margin of 10.22 lbs - nearly the weight of their kicker! They were awarded $20,000 for their 1st place win, another $1,000 for Big Bass, the $200 Costa Del Mar bonus and the $200 Sure Life bonus. Todd Town and Tony Lapaglia won 2nd place with 26.90 lbs. Their day started fast and furious, catching their four largest fish of the day within the first 20 minutes of the tournament. "We were using Oldham and WarEagle jigs along with big worms in 20-40' of water. It started out so intense, then it just shut off." They wrapped up an initial limit by 9:30, and continued to improve their overall weight until 12:00. "Our bigger fish were caught early and in deep water. They were starting to look pretty stressed in the livewell, so we decided to come on in and weigh them about 2 hours early so they could be released back into the lake." Among their creel were two 7 pounders, a 5 and a 4 pounder. The team enjoyed a $5,000 payday for their 2nd place finish. Andrew Upshaw and Ben Matsubu, who normally fishes the East region, traveled across the state to fish in this event. Pouring their efforts in water 30'-60' deep using jigs, they achieved 3rd place with 24.48 lbs that included a 7.52 lb kicker. They won $3,000 and could have doubled their winnings as the highest finishing team with a qualified Skeeter boat. They left the Skeeter in East Texas, and fished out of a different one. Chad Potts, President of Bass Champs, did not let them get by it quietly. They are likely to be fishing from their Skeeter boat in future events. Wrapping up the top five were 4th place winners Brian Fleming Jr and Mike Fleming, and 5th place winners Albert Hudson and Bill Kingsbery. Hudson and Kingsbery doubled their 5th place winnings having fished from their Skeeter Boat and being the highest qualified team. 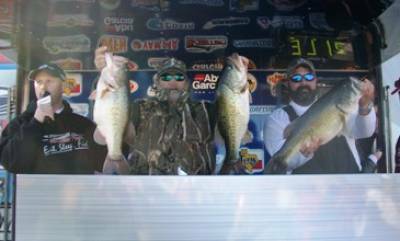 The next stop for Skeeter Bass Champs will be January 23 on Sam Rayburn as the East region begins its 2010 season. For more information contact Bass Champs at 817-439-3274 or visit www.BassChamps.com.